Generally, "earthworm" is a term used to refer to any worm whose body is segmented, burrows into the soil and belong to the class Oligochaeta. In all systems of classification, earthworms are put under the order Opisthoropora. "Red wigglers" are a group of earthworms renowned for use in compost bins and as fishing baits. Without keen observation, these two types of worms may be easily confused. An earthworm's body is usually segmented and reddish brown in color. The different earthworm species range in size from a quarter of an inch to about 6 inches. According to statistics, a 22-foot-long earthworm was discovered in South Africa. Red wiggler worms measure between 2 and 3 inches long and are slightly reddish-purple in color, with singular yellowish blemishes at the tips of their tails. Stripes are evident in some red wiggler worm species. Red wiggler worms, aka simply red worms, usually thrive in warm environments, so compost bins benefit from them the most. Moreover, they are adaptable to temperature fluctuations, surviving in environments whose temperatures range from freezing to around 95 degrees Fahrenheit. Another fact about red wigglers is that they are heavy breeders who live on organic waste and the microorganisms found therein. By contrast, earthworms thrive in open gardens; you will likely find them in backyards and flower beds. Given that they require moist soil for their survival, earthworms normally burrow into the ground once conditions at the surface become unbearable dry and cold. 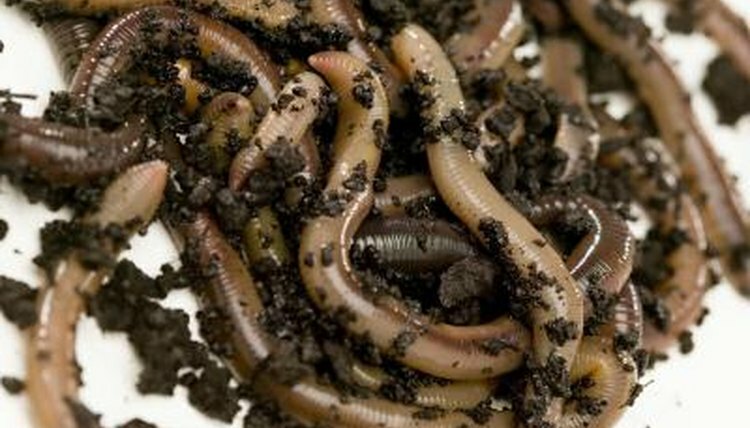 Earthworms feed on dead organic materials that they carry with them into the underground. Earthworms can eat food weighing up to their body weight. Red wigglers differ from earthworms in their aggressiveness, though they eat as much as the earthworms do. Red wigglers take their food on the soil surface; earthworms do not. Red wigglers are of immense help to gardeners, as they help decompose dead organic materials to humus, which adds to the fertility of the soil. Red wigglers reproduce more rapidly than earthworms. Dwelling on the surface makes them suitable for compositing bins. Given the fact that earthworms are burrowers, they may kill themselves as they attempt to burrow to the bottoms of bins. This means the gardener would have to continuously turn the compost, since the earthworms won't be bringing material to the surface. For this reason, earthworms are unsuitable for compost bins.